It seems like we can't get through a weekend without a Starcraft 2 tournament or showmatch somewhere. This weekend, however, is special: GSL (Global StarCraft League) finals on Friday evening--that's tonight!--and the Team Liquid Starleague 3 beginning at 11am Pacific Time on Saturday. Let's recap the action so you're ready. The Intel Extreme Masters tournament took place in Hanover, Germany, during CeBIT 2011. The top results weren't terribly unusual--Korean players Ace (team ST), Moon (team FOX), and Squirtle (also team ST) took first, second, and third, respectively. Both Ace and Squirtle had acquitted themselves nicely during the GSL Team League tournament, and it was no surprise to see them do well in Germany. Moon hasn't been doing quite as well in the GSL, however (he lost in the first round of the recent Code A tournament by Virus from team ST), and a second place finish might be just what he needs to get back in the game. The more interesting story to emerge from IEM actually came from a four-round tiebreaker that happened during the qualifying group rounds: Squirtle, SjoW (team Dignitas, Sweden), and Socke (team Attax, Germany) all went 2-3 in their group of 6, meaning they had to play each other in a series of tiebreaking games. However, each player went 1-1 against the other two players during the first four tiebreaker rounds, making the tournament last for a few more hours in breathtaking tension until Squirtle won and moved up to play IdrA (team Evil Geniuses, USA) and eventually take third. Once again, the GSL Code S tournament is down to its final two players: Season 3 champion MC (team oGs) and July (team ST). They've already played each other a few times: MC beat July in the season 4 round of 8, leading July to request that he be positioned in MC's bracket during the first round of the current GSL season. MC beat July again, sending July to play season 4 champ MVP (team IM). July won, and both players continued in the tournament only to meet again in the finals. Clearly, MC has the edge in this matchup, with two decisive recent wins over July, but the week-long break between the semi-finals and finals gives both players a chance to prepare for their last opponent, and there's no question that team ST ("Startale") has enough high-level players to help July give MC a run for his money. 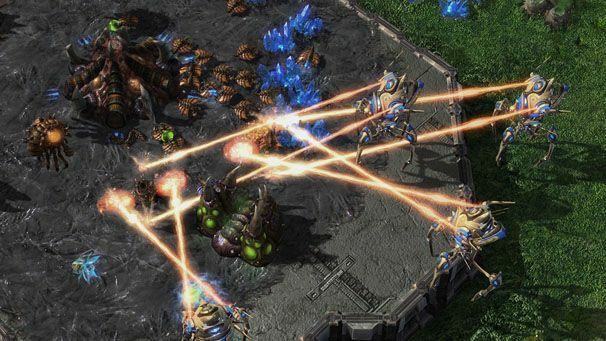 Meanwhile, the GSL Up and Down matches this week gave hungry Code A players a chance to move up to Code S status and grab a shot at some harder competition and a bigger paycheck. This season's Up and Down matches had a few rather notable casualties: eSports legend SlayerSBoxeR (team SlayerS) simply hasn't been able to cut it in Starcraft 2 competitions lately, losing to Zenio (team oGs), while season 4 champion MVP lost to Alicia (team SlayerS), meaning both players will be in Code A for the next season. On the other hand, Code S will see three high-powered Zerg players soon: Code A champion LosirA (team IM), inaugural GSL champion FruitDealer (team TSL), and Zenio will all be in Code S tournament. This may signify a change from the Terran-heavy Code S in seasons past. While the GSL winds down, another tournament is re-entering the fray: The Team Liquid StarLeague is back from hiatus, and they're kicking off their tournament with several high-level players, including Tyler (team Liquid), SlayerSBoxeR, Sen and Fenix (both team Fnatic) and FruitDealer. This tournament culminates in a live grand finals New York City event with a $15,000 first place prize. You can check that out this weekend (starting Saturday at 11am Pacific) by streaming it from Team Liquid's Web site.